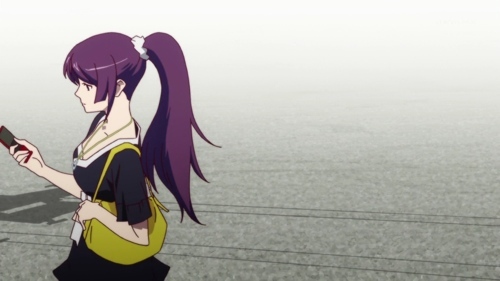 Well after the token effort by Koyomi to help Mayoi in episode three of Bakemonogatari we finally spend some time with them all walking around the neighbourhood looking for what we later find out is Mayoi's mum's house. I'd forgotten for the first few minutes that this was a part two and didn't understand the significance until I remembered it was Mothers Day. I'm not slow I'm just… wait, did you just call me… slow? 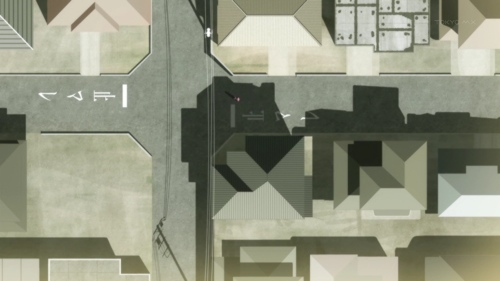 Despite HRH Hitagi allegedly only leaving the neighbourhood a year ago, due to that pain in the arse known as urban renewal the trio are constantly overshooting where they're supposed to be going. And I thought she was supposed to be a genius; well I guess she said it herself that intelligence is a relative thing isn't it? Anyway despite an exhaustive search with some killer backdrops that alas become a bit tiresome after seeing them several dozen times and despite her calling on Epic Hawaiian Shirt Guy and despite using her mobile phone GPS whatsit they never do find Mayoi's mum's house and the return to that gigantic playground. I think that was it. Wait, did you just call me slow? I was hoping I wouldn't ever say this about Bakemonogatari, but this was the first episode I saw that I wasn't terribly fussed about. 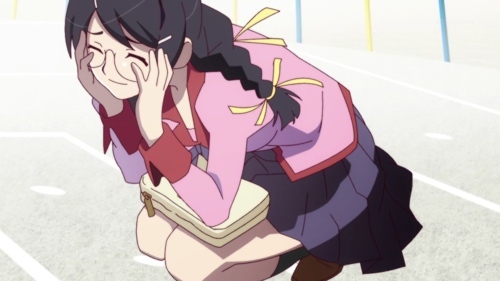 When I first started watching I was blown away by the production quality and the awesome characters, but even Hitagi's witty, deadpan-delivered lines that I admit to loving perhaps a little bit too much couldn't save this otherwise relatively lifeless outing. As I said in my previous review, often I revel in trivial, silly episodes where very little happens; I made reference to the infamous episode where the story revolves just around Kyon collecting a room heater as being one of my favourites of the series. For this episode though, not so much. Perhaps this series set my expectations a little too high so when it came up with something more mediocre it had much further to fall, if that makes sense. Ah well, here's looking forward to episode 5. Oh one thing I did forget, this huge playground park thingy did lend itself further to some extremely convenient character placement; for the first time since episode one (nowhere near enough, I might add) we see the Class President to End All Class Presidents again, though after seeing Mayoi's and Koyomi's confrontation all she did was bend down and pat her on the head! Ah the impracticality of it all ^_^.